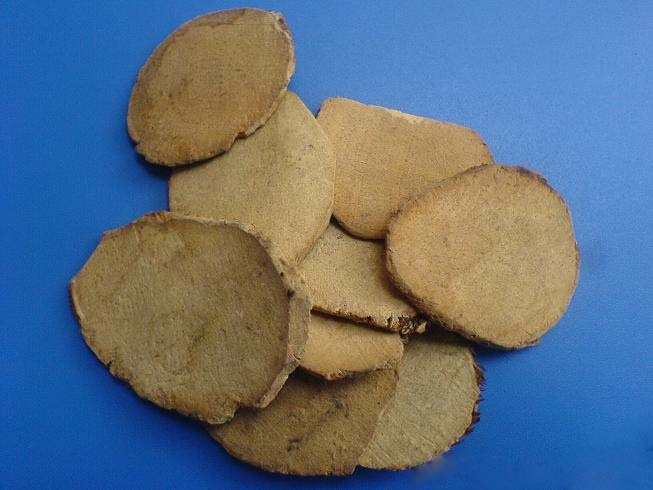 The dry tuber of perennial herbaceous plant Sparganium stoloniferum Buch.-Ham. of family Sparganiaceae. Jiangsu and Henan provinces in China. Light smell and taste, spicy and tongue-numb taste when chewing. Heavy, firm, without peel, yellow and white surface. Pungent, bitter, neutral; liver and spleen meridians entered. Break blood and move qi, resolve food stagnation and alleviate pain. The action of this herb is almost as same as that of E Zhu. They are mutually reinforced. However the blood-breaking action of San Leng is stronger than that of E Zhu, but qi-breaking action is weaker. Decoct 3~10 g. The action of stasis-dispelling and pain-alleviating is enhanced when processed with vinegar. Same as E Zhu. This herb is drastic in property with the disadvantage of consuming qi and impairing blood. Do not overtake long. Prohibited for pregnant women and during menstrual periods.